Let’s face it, there’s a pretty bewildering array of baby carriers and slings and wraps available. While the myriad choices can seem confusing, once you know your ring slings from your buckle carriers, things get a whole lot clearer! So here’s our rundown on how to shop for the best baby carrier for you and your tot. Here’s a simple guide to the products you’ll encounter, and some advice on how to choose the right baby carrier for your family. Note that while the language around the carriers can cross-over (!) and be a little muddled at times, there are a bunch of basic features that differentiate them from one another. Let’s begin! A ring sling – like the Hug-A-Bub Organic Traditional Ring Sling – allows cross-body wearing of your baby and is a great choice for breastfeeding mums, because it allows easy access to the breast. This kind of baby carrier comprises a piece of fabric that’s pulled through rings and secured, to allow personalised adjustment and make carrying comfy for parent and child. Depending on the person carrying, they can be used from birth through to toddlerhood. Ring slings allow larger children to be more easily carried on a parent’s hip, too. The Manduca Ring Sling is another great example of this kind of carrier. Simple, traditional baby wraps are comprised of a strip of fabric that is cleverly tied around a parent’s body with their baby tucked inside. They can be worn across both shoulders, or just across one, depending on how they are tied. Once you work out how to safely secure these wraps, they’re a super comfy option for parent and bub. You might find these features in carriers marketed as ‘slings‘ too. Check out the Hug-A-Bub Organic Wrap or the Hug-A-Bub Organic Pocket Wrap if you’re in the market for a wrap-style carrier. Buckle-up carriers – like the Ergobaby Omni 360 carrier or the I-Angel Rainbow 2 carrier – are comprised of a hammock style pouch that supports your baby, while their limbs are allowed to hang freely. Buckle-up carriers have a series of straps that secure your child to your front (or back!) safely and comfortably – and can be adjusted for different adults. There are no knots to tie or fabric to be threaded. Simply put your baby in, click the buckles closed and go! These can be less ideal for breastfeeding-as-you-carry, but are still loved by mums and dads looking for a simple, stylish, hands-free way to carry their child. Pouch slings are made from a tube or ‘pouch’ of sturdy fabric and are a less complicated choice that you can simply tuck your baby into. Your child can be carried cosily snuggled away from the world. Once they’re adjusted to fit you, you can simply put in on, whack your baby in and go. These are a great choice for mums who want to breastfeed on the go too. Backpack-type baby carriers have a rigid frame and are built to carry babies through to toddlers. They’re a great choice if you are into activities like bushwalking or hiking. 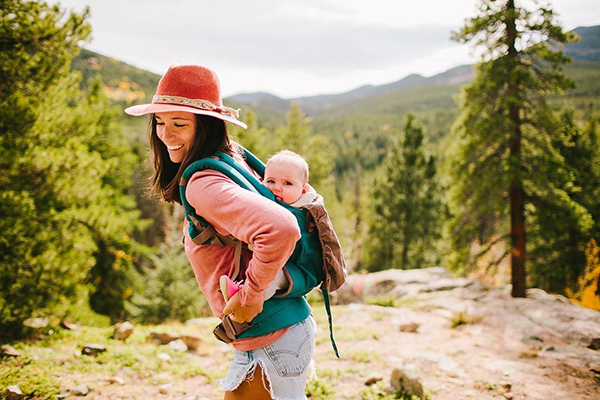 When you’re shopping for your first baby carrier, there are a bunch of things you can keep in mind, to get the best fit and make the best choice. It’s a great idea to go shopping for a carrier with a friend who has a baby – so you can actually do a proper test run – but failing that, ask staff to assist you and go through the finer points of your choice before you buy. Check out your chosen carrier’s hashtag on Instagram, to see other parents using the model you’re thinking of buying. You could also message mums and dads and ask them how they’re liking the carrier they use, to get some feedback straight from the horse’s mouth. Head in-store and get your mitts on your carrier of choice. Is it easy to put on, put your baby in and adjust, all by yourself? If you’re a little befuddled, ask for help from sales staff and practise popping your chosen carrier on independently (in-store), before you commit. How does the carrier feel, once you do have it on? Is it causing any discomfort? Are the straps comfortable? Can you readjust it for a better fit? Does it seem comfy for your baby – or future baby – too? Make sure it not only looks good, but feels good and you’ll be well-sorted. Ensure the carrier you choose can be used in the way you want to use it. Check the configurations it’s designed to be adjusted to. Some carriers can’t be used across the body, for instance, while others are best used on the chest or back. Is the fabric practical and long-lasting? Will it be easy to clean and work in with your usual style? While there are no official Australian safety standards for baby carriers, the Australian Competition and Consumer Commission have published a brochure with advice for safer sling buying. You can also check out the Choice guide to buying a baby sling or carrier. Is the sling age-appropriate for your child? If you’re planning on using it with a newborn, make sure that it’s not too big. If you’re buying a carrier for an older child, make sure you choose something that can carry them as they grow. Again, check with sales staff in-store to ensure you’ve made the right choice. Baby carriers are an excellent choice for parents who want to get out and about without dealing with a stroller or pram. They’re also a perfect choice for busy parents at home, allowing them to get on with chores as they bond with their baby (who is hopefully snuggled up asleep against their chest, calmed by that reassuring and steady parental heartbeat! ).